Herat, the third largest city in Afghanistan, houses about 400,000 people. Absent from any list of prioritized locations to visit on a vacation trip, it can however be an intriguing destination for the sensitive soul and the trained eye. This city, which lies about 400 miles east of Kabul, was located in the middle of the Silk Road. Trade routes between the Middle East, Central Asia and India used to pass and cross right here, making this place desirable to all neighbouring powers. As a former capital of the Timurid dynasty (which controlled an empire that included Iran, modern Afghanistan, modern Central Asia, as well as large parts of contemporary Pakistan, Mesopotamia, Anatolia and the Caucasus), Herat flourished as a rich city-state, a cultural centre of learning and commerce. It boasted many beautiful religious buildings and was famous for its sumptuous court life and musical performances. Still now Herat is an important centre for the arts and sciences, with a rich tradition of astronomy, mathematics, philosophy, music, calligraphy and miniature painting. Despite the extensive modern development and the effects of a long conflict, Herat has fought to retain its historical background. It's still considered one of the most rewarding sightseeing locations in Afghanistan, and strongly appears on the tentative list of the United Nations Educational, Scientific and Cultural Organization (UNESCO). 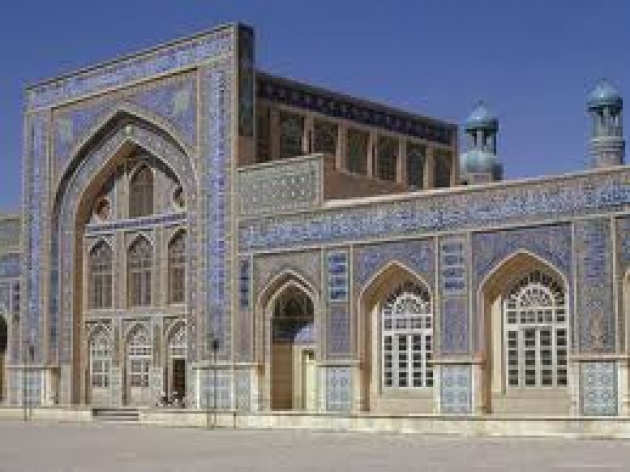 The Friday Mosque is one of the greatest Islamic buildings in the world and the Old City - the Herat Citadel was restored by UNESCO between 1976 and 1979 - is one of the few in the country to retain its medieval street plan. Herat’s post-Taliban recovery has been less rocky than other parts of the country, due in no small part to the customs revenues from trade with nearby Iran and its international airport (built by the United States in the '60s and used by the Soviet Union in the '80s). Visitors coming from Kabul will instantly notice the difference: a reliable power supply, streetlights and public parks. It's in Herat that Filmannex and the Afghan Citadel Software Company will open on June 26th another Internet classroom in another school, the third in nearly three months. Established in 1938, Hatifi High School is one of the largest schools in Herat: 8300 students attend classes in rotations. The school offers 116 classes only for female students. Twice as many computers are being provided to satisfy the needs of the school population. At this pace, 160,000 children in Herat will be able to navigate the Internet with 3 years. Another step forward for the educational system in Afghanistan. Another step forward for the economy of Afghanistan.